Best Pay-Per-View Matches has always been one of my favorite DVD releases of the year. I don’t buy every PPV event on DVD, so it’s nice to get a collection of the best matches from these events without having to buy each and every one. The DVD also works as a nice survey of the year in question. I think this particular collection shows that the year 2012 has been a really great year for in-ring wrestling in the WWE (even if they don’t like saying the word wrestling anymore). CM Punk, Daniel Bryan, Dolph Ziggler, Sheamus, and many others have really stepped up their game, and we got great appearances from The Rock, Triple H, The Undertaker, and Brock Lesnar. Unlike many of my other reviews, I’m not dedicating an entire section to “The Format” of the DVD. It is hosted by Scott Stanford, and he only occasionally appears throughout the DVD. It doesn’t add anything. Discs 1 and 2 of the Blu-Ray each run approximately 4 hours. Disc 2 contains 2 hours of “regular content” and 2 hours of Blu-Ray exclusive content. The Blu-Ray is rated TV-PG. As good a match as you would expect between these two. Laurinaitis is a bit distracting here; I’m still not positive what they were going for with his involvement. One of the weaker Elimination Chamber matches in its short history. There are some fun spots, but as a whole it’s nothing special. Santino is used very well in this match, though, and it shows that he can be used as much more than just a comedy character. I know most fans do not go the full 5 stars for this match, but I honestly feel that the storytelling in this match is unparalleled and is enough to earn the 5 stars. I’ve never seen a match filled with this level of emotion, and I was completely invested in it. Michaels adds so much to the match as guest referee, and the match serves as a great “end of an era”. This match ended up delivering as well as I expected. The atmosphere in the arena helped push the match over the edge as well. 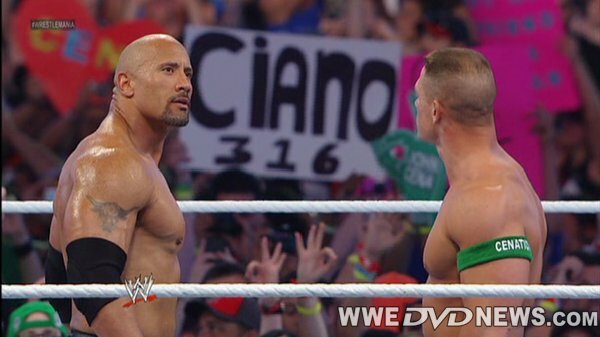 The Rock proved he could still go in the ring, and Cena was a great opponent. Your token divas match for this set. Nothing special here. A great technical match, something we’ve been seeing more and more of in the WWE. This match is also a good showcase for Rhodes, someone who showed a lot of improvement as he moved up in the card in 2012. Not nearly as good as their match at Over the Limit, but still a very good match. I liked the choice to have AJ get “knocked out” shortly into the match; this allowed Punk & Bryan to have a lot of time to wrestle without AJ serving as a distraction. A bit of a disappointment, but still a very solid match. The storytelling is fantastic, but the match moves a bit slowly. The WWE succeeded in giving this a “big match feel” as well. A great match, and another great showcase for Ziggler, one of WWE’s 2012 MVPs. I believe the WWE edited out Orton cursing out the fans and flipping them off (I didn’t notice it), but part of me hopes I just missed it and it was left in to show how immature Orton’s 2012 was. Punk & Cena have amazing chemistry, and this match is no different. Fantastic storytelling that leads to a satisfying way to have a non-finish in the match. Punk’s reaction to finding out he was still champ is wonderful. This might have been the biggest surprise of the year. I didn’t expect Sheamus & Big Show to have an awful match, but I don’t think many fans were expecting them to have such good chemistry. The last few minutes of this match in particular are really great. The feud between Cena & Kane was one of the weaker storylines in the WWE this year, and for some reason, the two men never put together quality matches. This match has some entertaining highspots, but drags and doesn’t totally come together. An excellent technical contest, which showcased both Bryan & Sheamus’ skills extremely well. After the disappointment of not getting a full match between the two at WrestleMania, we were treated to a classic the next month. Like most Money in the Bank matches, there are some great highspots, but this match never really elevates past “spotfest”. There weren’t many storylines going on between the competitors in the match, which gave most of the highspots less meaning. This was a unique match, because the WWE wanted to make Ryback look like a monster without making Punk look weak. There’s some solid storytelling here, but the match itself moves really slowly, and the finish is a bit of a disappointment. As I mentioned in the opening of this article, this really was a great year for Pay-Per-View Matches, which makes this a great DVD overall. I think the WWE did a nice job in choosing which matches to include. Almost every match ranks above ***. I can understand not wanting to include Punk Vs. Jericho from WrestleMania or Punk Vs. Bryan from Over the Limit since they were both just released on the Punk DVD, but we really should have gotten the Punk/Jericho rematch from Extreme Rules. That is probably the largest omission. The only match that I really don’t think should have been included was the Cena Vs. Kane Ambulance Match. The Cena/Kane feud was one of the worst WWE storylines this year, and the match isn’t great. Even though Punk Vs. Ryback isn’t great, I don’t have a problem with this being included because I like that Ryback got a spot on the DVD; he was a big part of the WWE this year. Whether it was intentional or not, I also liked which superstars got the most matches throughout the set. There was a lot of CM Punk, Daniel Bryan, Dolph Ziggler, Sheamus, and John Cena, and these men felt like the workhorses of the WWE throughout 2012. Most fans already know whether or not this DVD is for them. If you already buy each PPV on DVD, then the only real reason to get this would be to get some of the matches in HD for the first time. For fans like me who don’t buy every PPV, I think this is an easy recommendation, and probably the best installment of the Pay-Per-View Matches series yet. There are a lot of great matches on here, and it caps off a great 2012 nicely. Great review. They show the best from most of the PPV’s as the set ends at HIAC but I think these sets should be released after they year ends so they can cover every PPV including Survivor Series and TLC. As for exclusive content, I own a blu ray player so I don’t care as I’ll get everything either way. But, I’d really like to see the participants comment on their matches and that should be somewhere on the set IMO. Probably after each match ends as it’d be the perfect place. I really like to know how they feel about their matches as well as their views on the pros and cons of the bouts. I agree that Punk vs Jericho from WM although I liked their Extreme Rules match too so I wouldn’t mind of both bouts here as well as Punk vs Bryan from OTL. This DVD is great. Combined with the Extreme Rules 2012 DVD, you would truly have the “best” of 2012! I already ordered this blu-ray and hopefully it is coming soon. It’s too bad they finished the DVD too early because I would have loved to see the 6-Man TLC match on this set or the Foley vs. Ziggler Survivor Series match. They should consider releasing this DVD in March in the future. What I like about this blu-ray is that the only repeat for me is the Bryan vs.Sheamus match and that’s okay because it’s probably my favorite match of 2012 and I want to see it on blu-ray. Other than WrestleMania, SummerSlam, Survivor Series and Royal Rumble, I too don’t buy each and every PPV unless the entire card is good. That is the main reason I purchase this DVD series without question. I would like if they chose to release this in January or February each year so they can add TLC and Survivor Series matches. The match with The Shield vs Hell No and Ryback would have been the perfect edition, had they waited just a bit longer to release this. I really like the cover for this one. Another glaring omission, the Cena/Lesnar match from extreme rules. One of my favourites of the year. I think the main reason that wasn’t included was because it was on the Lesnar Here Comes the Pain DVD, and the WWE have tried not to have too many repeats this year. The only repeats from past compilations are Rock Vs. Cena and Triple H Vs. Taker, and both of those matches really needed to be included. Cena/Lesnar was a Blu-ray exclusive, not on DVD, so i think they still could have included it. But i agree, they wanted to have less repeats, and a Best PPV Matches 2012 DVD/Blu-ray needed to have Cena/Rock and HHH/Taker. The set is still solid, only wish they could have included Punk vs. Jericho from Extreme Rules. I’m like 99% sure that the main reason they didn’t include Lesnar vs. Cena is because of the blood. Including that match uncut would probably make this DVD TV-14 just like the Extreme Rules DVD. If there is one PPV DVD to own this year, it would be Extreme Rules…good PPV. Good point Tony…Extreme Rules was the first PPV DVD since Great American Bash 2008 to be rated TV-14 which was definitely because of Lesnar vs. Cena, it was a very bloody and violent match to take place in the “PG era” that people like to call it.